These days, my day job (Santa Fe Metal Design–santafemetal.com) keeps me very busy. 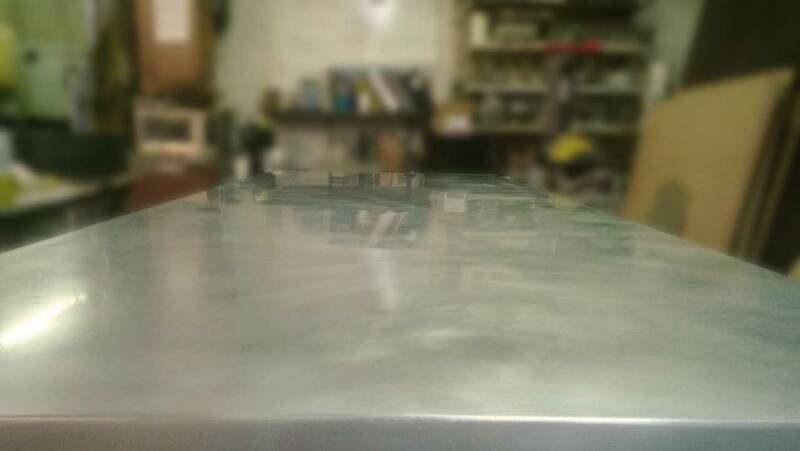 Lately, customers are requesting zinc counter tops. Zinc is the hot metal right now. For those that do not know, I do lots of work with copper, as in copper lighting, copper counter tops, copper range hoods, and all kinds of copper architectural work. Zinc is another food-safe surface. It is a beautiful, silvery metal that with time, creates natural and darkening highlights and low lights. It is highly reactive (like copper) to acidic elements like lemons and tomato juice. That’s not a bad thing, in my opinion. It adds to its character! It’s a soft metal, too, so little scratches will only add to its luster. Here is my Facebook page. It has images of various work that I have done (just the tip of the proverbial iceberg). “Like” my page if it motivates you.